Maki Miss Universe fever muna.Lol. One of the most anticipated parts of the pageant is the presentation of National Costumes. This is the time that each contestants will showcase the richness of its culture and as a nation through an elaborate and colorful display of their costumes. Pabonggahan ang labanan. Baklaan kung baklaan (lol), ang importante ay mahalagang (lol) - bongga ka Day, itaas ang kilay. Haha. Hosted by Nick Teplitz (sino siya, lol), on Saturday, January, 28 in the Mall of Asia Arena, the National Costume competition took place. This year's presentation is by far the grandest, the largest, the longest and even the heaviest (lol) in pageant's history. Well, at least for me. Most common from its inspiration, are the birds, the flowers, ocean and yes.. mother Earth. Lol. But did you know, that a drama just happened in the backstage while the event is going on? I'm sure, if you watched the show aside from Nick's constant buckling (no, not just several, lol). There was this incident where he called out Miss Mauritius (because that was supposed to be on the cue card) but it was Miss Mexico who popped up the stage. He apologises for the error, I'm not sure if he was aware then that an accident is happening backstage. Yes, because Miss Mauritius has a serious accident backstage that it involves blood - yay, blood spare me, I'm gonna faint. Lol. While she's about to make her grand entrance somebody, accidentally stepped on the caped train of her attire that she fell head first on the floor. The impact must be hard that a blood oozed from her lips, it took her quite some times before she regained her composure. She was advised not to participate in the presentation and just rest to fully recover but she insisted crying that she cannot let it passed the opportunity showcasing her costume knowing how it was painfully and the overwhelming helped from different groups of people for putting it together. Miss Mauritius costume was designed by a Miami based Filipino designer Kirsten Regalado (who btw, serving as one of the organizer of Miss Mauritius - Universe). And that the entire ensemble was put together by the students (including a 10-year old orphan) from La Consolacion College - Bacolod. Her costume was consist of three elements. A headdress, a three-piece gown, and a cape. 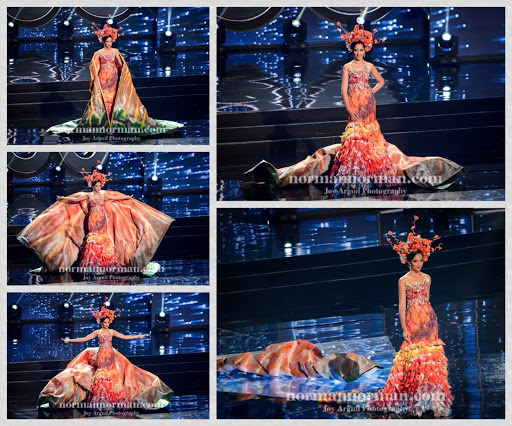 The headdress was made of red fabric representing volcanic eruption and Mauritius flora after the eruption (may drama - ginawang ulan ang eruption biglang tumubo mga bulaklak, encantadia ang peg, lol). The overall inspiration consist of the seven distinct colors of Mauritius earth's representation, attributed from volcanic eruption and other geological formation giving red, blue, brown, purple, violet. And green and yellow representing the hilly sand dunes of the country. My favorite from yesterday's parade was Miss Myanmar. Boy, that was heavy and clever, if you ask me. Never I have imagined you can be both a stage and a performer. Lol. 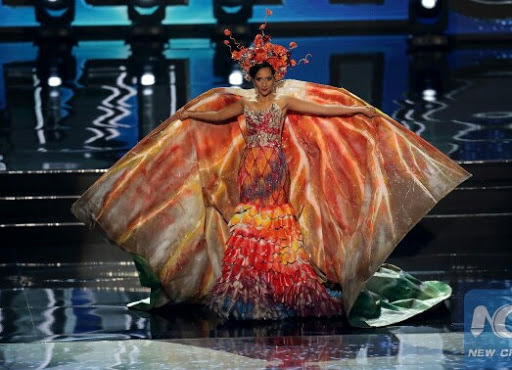 Miss Venezuela's ocean inspired costume was regal. Miss France Moulin Rouge was playful. And I thought Miss Vietnam was charming. I love it when she turns backward. Lol. Ikaw alin ang mas bet mo?